Optical illusions and "impossible" figures have always fascinated me and judging by the popularity of the artist, M C Escher, I am not alone in this. I have included murals on this page since, if one is done well, it can change the whole room giving an an extra window or an extra dimension to the room. 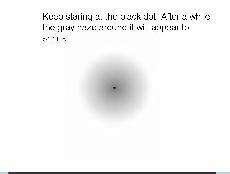 Before scanning this page, it is strongly recommended that you undergo the simple eye test which appears below. Simply move away from the chart until a clear message emerges. 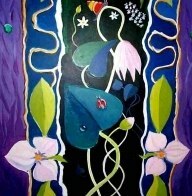 This is a mural which I painted on my bathroom wall originally at the request of my daughter. 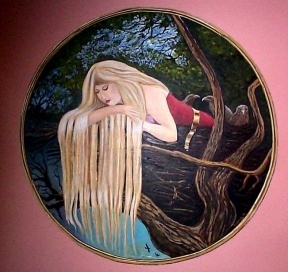 It is based (loosely) on an H J Ford illustration in one of the Andrew Lang Fairy Books (the Crimson one) and depicts Wild Rose who was snatched from her cot by eagles when she was a baby. Now that my daughter is all grown up and sophisticated, she actually sneers at it, saying that it looks like Tracy from Principles (I think I know what she means) but it has a certain something. It is also a tribute to the wearing qualities of Alkyd as a painting medium medium since it has got steamed up several times a week for the last ten years and shows no sign of deterioration. I have seen this one used as an explanation of the difficulties experienced with the vote counting difficulties in Florida which saw George Bush's winning the crucial vote in Florida.Vote counters were instructed to count the white spots as votes for "Dubya" and the black spots for Al Gore.Suddenly the reason for Bush's supremacy becomes all too clear. This is variant of the impossible tuning fork. What makes sense at one end of the drawing is suddenly impossible at the other end. Dutch artist MC Escher is (was?) a master of impossible images with waterfalls flowing upwards and steps forever climbing but never reaching the top. How many colours can you see here? Surprisingly, there are only three - white, green and pink. 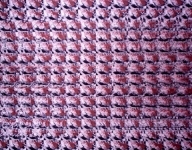 The darker pink is an illusion caused by the green surrounding the "dark" tiles. This effect is used extensively in painting - the eye "mixes" the colour. Another very good source of illusions as well as explanations of how they work is the web site of Professor Michael Bach, which has 70 illusions, many of which are animated or adjustable so that you can see how the strength of the illusion is changed by different conditions. Even stronger effects can be obtained by juxtaposing sequences of tone or colour which give a strong feeling of motion when they are seen on the periphery of a viewer's vision. One of the leading exponents of this type of illusion is Professor Kitaoke Akiyoshi who has produced some stunning examples. This one would make a very good tee shirt for Alcoholics Anonymous! 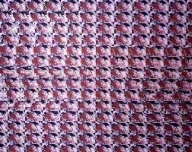 Warning: Anomalous motion illusions of this sort can induce feelings of dizzyness or nausea in some viewers. If you are affected, you can get instant relief by hovering your mouse pointer over the "Hide" button below. Crawling Kingsnakes - a real "Blues" illusion! 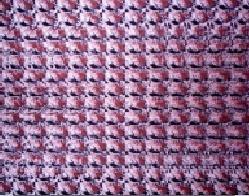 At the height of the Magic Eye craze, I bought a copy of Popup Pro to create my own Autostereograms. This is one of the better examples.Most people are now able to make these work but if this is your first attempt, look at it and focus on it so that it is sharp. 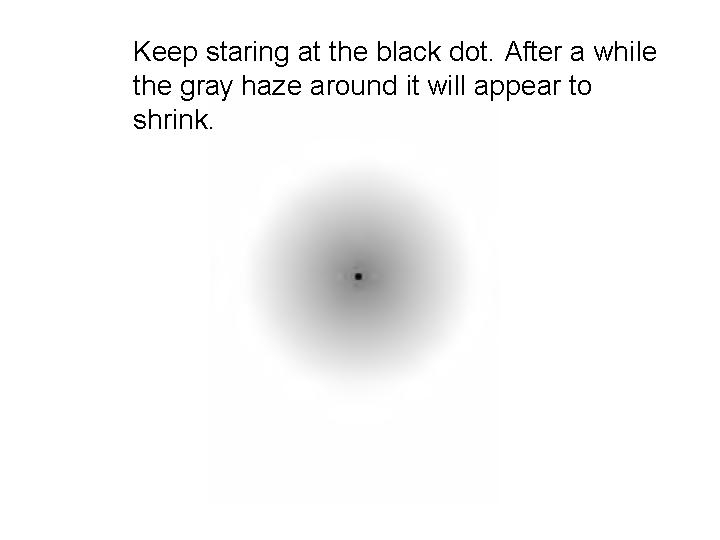 Now imagine that the point of focus has shifted back by about 15 inches, say to the back of your monitor and refocus your eyes.Suddenly you should see the 3 D image of a moth and the background pattern will appear extremely flat. If this does not work, try again after several large drinks. 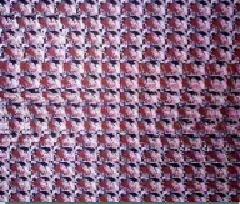 As some time has elapsed since I first posted these autostereograms, I thought that I would check to see whether PopUp Pro is still available. Of course what has happened is that pop ups are now things that are actively detested and so all references to popups relate to anti-popup software. I just thought that another excuse for a few more large drinks would be appreciated. Once the image has emerged, you will also see my initials in the bottom left-hand corner. If you have arrived here by reading through the rest of the page, you will have seen references to impossible figures already. These are figures which look convincing until your scan them from side to side or from top to bottom and find that something doesn't quite fit. The most famous impossible figure is the impossible triangle which has been credited to Roger Penrose who published it in 1958 although Retutersvard is a contender for the credit. Although they look impossible, they can be actually constructed if the right materials are chosen. 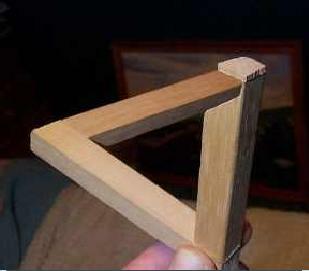 I was lucky enough to obtain a small quantity of wood from the German Moglichkeit tree from a specialist supplier in Dusseldorf and, using e-Poxy glue, managed to construct the example of the Penrose triangle pictured here. Some viewers have claimed that this is a poor Photoshop trick but it is real. If you are going to produce an impossible figure, do it big. 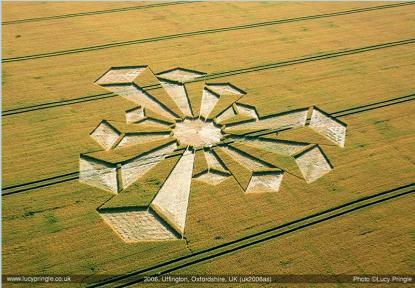 This impossible figure was photographed by crop circle expert and aerial photographer, Lucy Pringle, near Uffington in the Vale of the White Horse. If you want to see more of Lucy's work follow this Link. .....but British farmers are fighting back. 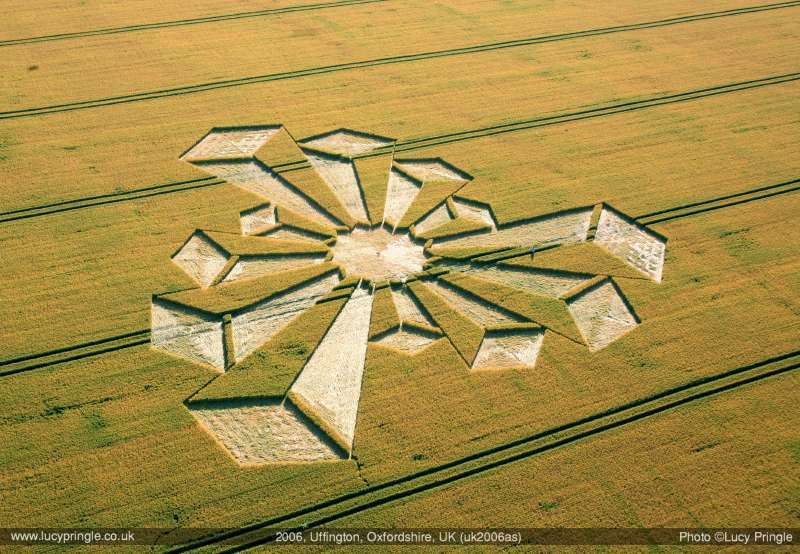 Not all crop circles are the work of alien superintelligences. This Link will reveal some leading edge efforts from Scotland and the North of England as seen on Google Earth. These generally rely on being able to ensure that the viewer is in a certain position where the illusion is at its height so that they are best when seen from a doorway or through a hatchway where the limited movement imposed on the viewer ensures that object is seen in the correct perspective. 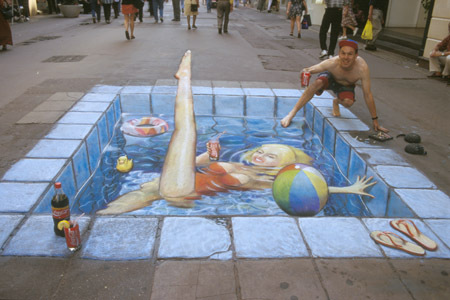 In the case of the images below by Julian Beever, they they are deliberately distorted so that they appear upright to a viewer in the "right" place. 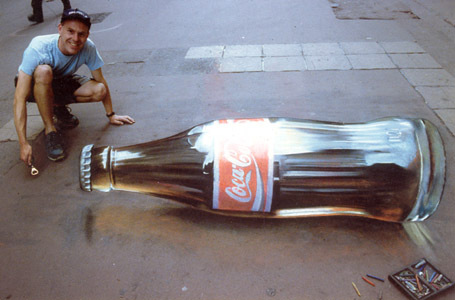 In the case of the coke bottle, not only does it look solid but it is the right shape and the addition of the light shining through it is a touch of genius which helps to add further conviction to the image. Unfortunately, the only permanence that his works have is photographic - they are all done on the pavement and are washed away by the rain after a few days. The Science Museum should commission one of his works so that people could see how the eye is fooled. 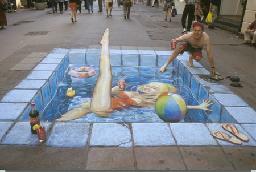 It took a lot more than that little box of pastels to paint this image!! 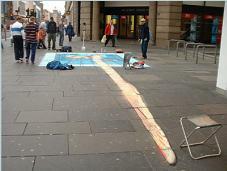 The second picture from the "wrong" angle shows just how much distortion (and how much chalk) is required to give the effect of the leg being raised. This is nowhere near the same scale as one of Julian Beever's masterpieces. 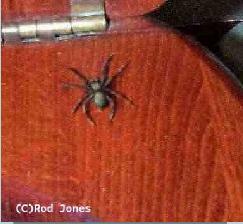 It was done for the benefit of my mother-in-law who hated spiders and my son's American girlfriend who is an eminent arachnologist. Neither of them appear to have noticed it but my son, Howard, who helped me to set up this Web Page, thinks it is a worthy addition. Some manufacturers of sanitary ware (that's the trade term for urinals) like to put images of bluebottles on the porcelain - presumably to encourage users to aim correctly in their attempts to dislodge them. This was a Christmas holiday project which was designed to fill a particularly blank wall space which is revealed when the sliding door between the kitchen and the dining room is closed. This was done completely from my fevered imagination as the fancy took me and, apart from one or two decorative ideas such as the flowers and the jewels, it took on a life of its own. 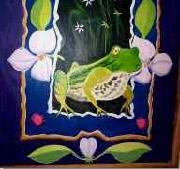 The toad at the bottom of the panel is particularly admired by visitors. The only thing about painting such murals is that we are increasingly being exhorted by TV make-over shows to declutter and paint everything magnolia so if I was to do this again I would paint it on a panel since the thought of painting it magnolia really hurts. These details show the water drop on the leaf which is a particularly noteworthy feature and the frog - no one has kissed it yet.